So, that's shot glass #2, right? And I'm guessing Tommelise is pretty close to printing #3. Things are starting to pick up. Apropos that, Ed's just about finished making the parts for the Darwin prototype on the Strat. The lot took 100 hours, and used one cartridge (4 Kg, I think) of build material. I'm guessing that you've not got a fan fitted to ARNIE? Build quality is much improved by a fan. In fact, I have a desk fan blowing air gently over mine in this weather all the time. Now that the heating element is enclosed in a trimmed bottle neck, gentle airflows don't affect it much. Any AoI files of Darwin bits yet? I'll add my congrats (and suggest you could have fabbed a larger shot glass). Looking forward to some video showing this in operation. Well I have a pic programmer wired up that I just finished tonight. I'll blog it after I verify it works if I don't blow up my computer. I'm questioning the Irishness of a dram of Jack D's myself, but otherwise congrats all 'round! Most important things first: the Jack D's was from the Bath University Biomimetics research students' extensive but uncritically-assembled sideboard, whereas the Irish whiskey (Jameson's) came later at the Bowyer homestead (where I, personally, re-celibrated with a small measure of 10-year-old Laphroaig). We'll try cooling next week, though things seem to be going OK without it at the moment. Now I think about it, that 4Kg has got to be over the top. If I imagine putting all the bits in a bag and picking them up I can't see it weighing more than 1Kg or so. Damn nice bit of work guys. What about storing all the AoI files of Darwin, etc, inside Subversion? Yup - we're getting there. Some parts of Darwin still need to be moved from Solid Edge to AoI (a manual process...). When we've done that we'll put the lot in the mechanics section of the repository. It would beintresting to see some parts made by the machine, so we can compare it's build quality to other reprapmodels. 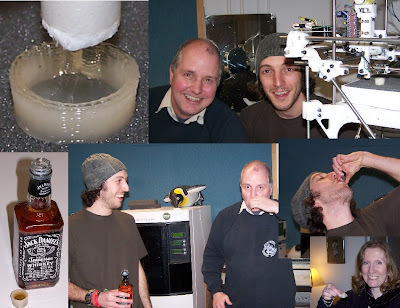 I can see the headlines now: In freak accident, RepRap designer confuses inches for centimeters - dies of alcohol poisoning!